Please note, tablescapes don’t have to extravagent OR expensive. Look around your house, ask your mom or other relatives for dishes/platters etc. I love including pieces of history at the table. My last fall tablescape was made from mainly thrift store finds [HERE]. This tablescape, some story! I chose a DIY Thankful Tree for our centerpiece. It’s important to reflect on things in life we are thankful for. This also makes for great dinner conversation. To start, I purchased winterberry and fresh cranberries from Trader Joe’s. While I was out, I grabbed a piece of shiny gold scrape book paper. Is that what it’s called? I cut the paper, punched a hole in one end and gathered some ribbon from my materials. Once finished, leave them out for guest to write what they are grateful for and have them add their tag to the tree. The tree is made of twigs and winterberry. I filled the case with fresh cranberries! The red is so vibrant. I found the blue plaid tablecloth on the clearance rack at Target. It was under $6. Small crocks for silverware. Anyone else love crocks? I used fresh cranberries and anise for a simple, but fresh look. The anise smells so heavenly. Tablesapes are a fun challenge for me. The fun comes for finding the perfect pieces, either at home or shopping / thrifting. The charges and glasses are both thrift finds. All the brass candles holders, including this beauty, is a thrift find as well. I used a mix of pumpkins and candles on top of the brass pillar holders. Each year at Thanksgiving, we receive a new Christmas ornament from our parents. We will carry this tradition on. The ornament has our name and year on it which also works as our name card at the table. I hope you all enjoy your time with your family and friends this Thanksgiving. I know I’m especially grateful for my family. My parents are hosting this year. I look forward to my mother’s delicious cooking! Super cute and so homey! I love your vintage style! 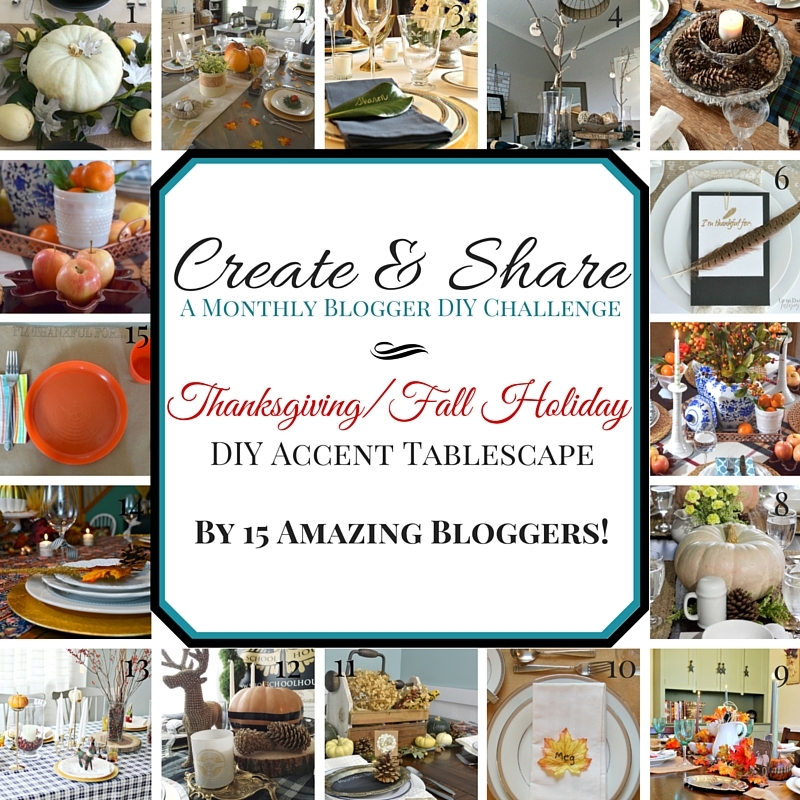 Hi, Sara ~ This is such a lovely tablescape, and I l love your Thankful Tree! It makes a beautiful centerpiece. Happy Thanksgiving! And thanks for sharing your tablescape. Thanks Tiffany!!!! Hope you have a fantastic Thanksgiving! That candle holder is amazing! Like I seriously want to come and steal it from you. The table looks gorgeous and I love the paper tags for the thankful tree. Hope you and your family have a Happy Thanksgiving! Thanks Sharon! I was very excited when I scored that holder. The hubby is coming down to Texas in 2 weeks, I’ll send it with him LOL Hope you guys have a great Thanksgiving too! I’m really looking forward to it! I love the berries Sara! They really add a wonderful burst of color. The table is beautiful, you did an awesome job. Enjoy Thanksgiving and your momma’s cooking! Thanks April! You have a fantastic Thanksgiving too! Your table is so picture-perfect; I love how you’ve guided us through how you can make such beautiful decorations! I love the colors, too. I love the fresh cranberries idea. Very lovely table setting. Love this! Especially the thankful tree! We have done one before, but this one is much prettier! I am thinking we will do this kind next year! Thank you Nicole. Enjoy your Thanksgiving! I have recently gotten interested in tablescapes as well. Yours is lovely, I love the simple centerpiece. I appreciate that it doesn’t have to expensive, just pretty! They are so much fun!!! Thank you Michele. Yes, it doesn’t have to be expensive, just be creative and resourceful! Happy Thanksgiving. I love up cycling! Pine cones, spray paint etc. Love the cranberry idea! It looks gorgeous and natural! Sara, I love your thankful tree! I love how you used plaid in the tablecloth and reindeer as well. So many lovely touches in your tablescape. Your photography is stunning as well. Love it. Pinned and Shared. Thank you Stephanie! Happy Thanksgiving! Wow, love this Sara! Your table setting has so much interest. The Thankful tree is gorgeous and I love the fresh cranberries. It must smell heavenly. The ornaments, candlesticks, and photography are simply gorgeous. Thank you Kathy!! Have a wonderful Thanksgiving. It looks beautiful and your photography is amazing! I don’t have room on my table for anything but the food and maybe some candles!! Thank you Leslie! I must admit, taking the photo is my favorite part! 🙂 Happy Thanksgiving and thanks for stopping by! What an absolutely stunning tablescape. I love all the gold accents and that tree branch centrepiece with the thankful tags is such a sweet addition!